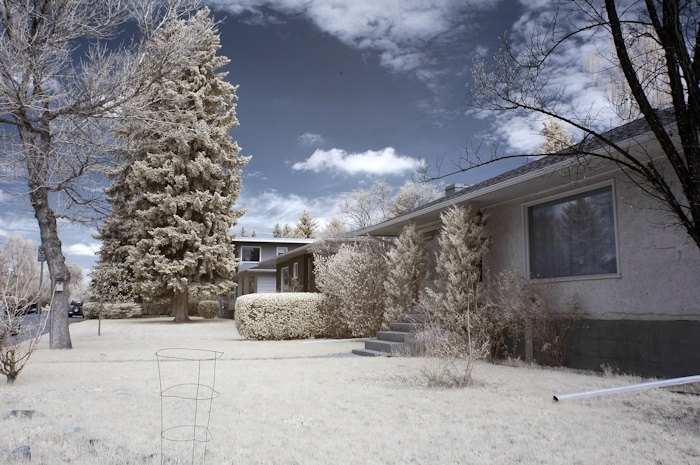 There are several ways to capture infrared images. 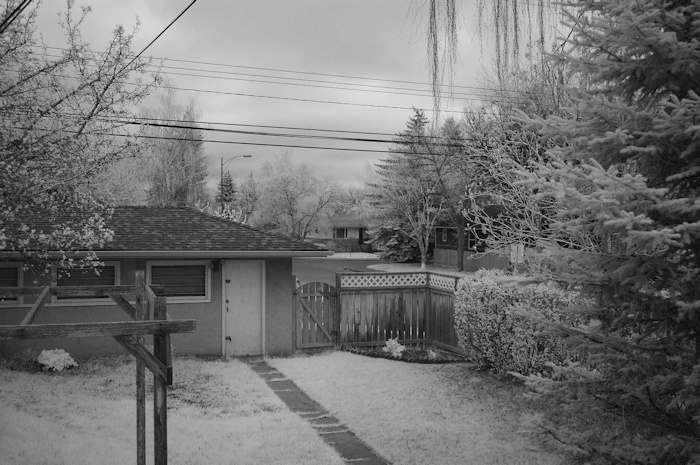 In the film days one had to buy infrared sensitive film and use a special infrared filter in front of the lens. Modern digital cameras are specifically designed not to capture infrared light and have therefore a special infrared cutout filter installed in front of the imaging sensor that filters out most of the infrared light. Some cameras have weaker filters than others and can capture infrared light with a infrared filter in front of the lens. The negative side of this method is that the shutter has to be open for long periods of time, hence requiring a tripod. Those two vendors are also selling special infrared filters for DYI projects. I chose the filter from Kolari as it was half price. The camera I had for the conversion is a Nikon D70 that I picked up for $50 from a local classifieds website. The D70 is an excellent donor for an IR project. It's a good camera with 6 Megapixels and a large image sensor. DSLRs are much better suited for IR photography as post processing the images require more dynamic range which compact cameras can't deliver as well. the following is a little writeup about the conversion. Please note that this procedure will definately void the camera's warranty. This is the Nikon D70 camera ready for the infrared conversion. It's extremely important to have a clean workspace and the right tools. You have to have a ground strap (useful for all electronic projects) and a good set of precision screwdrivers. The little black square you see next to the camera is the infrared filter. I chose a filter that is sensitive to a wavelength of 720nm. Next step is to take the bottom plate off. There are three different screw sizes for the bottom plate alone, so it's important to note what screw goes where. As with any project it's extremely usefull to take photos along the way, so you can see what you have done. This photo shows the bottom plate off. Sorry, the photo is a bit out of focus. Now one has to disconnect the two flex cables in the middle and on the right of the image. Those connectors are rather small, so one has to be careful not to damage them. If the connectors are damaged, it's game over. After the bottom plate is off, one can remove four screws, two on the left and two on the right side of the camera. Now the back plate that holds the LCD screen in place comes off the camera and reveals the CCD sensor board. This sensor board we need to get to in order to replace the infrared filter. With the CCD sensor board removed you can see the camera's shutter assembly. This is a good time to inspect the shutterblades for wear and tear and especially for oil residue on the blades. If you can see oil on the blades, it's not worth doing the conversion as it would require an overhaul of the shutter. If everything looks ok, you can go ahead and modify the sensor assembly as shown in the next steps. Here you see the CCD Sensor assembly board. The blueish tint on top of the sensor is the factory infrared cut filter that needs to be removed and replaced with the infrared filter. The filter is held in place by four tiny screws. This replacement is actually straight forward. The only difficulty is to keep the sensor itself free of dust. The way to do this is a to work fast, work with latex gloves and have a little airblower handy in case some dust settles on the sensor while working. Since I had to work fast here, I had no time to take a photo of the filter removed. And here you see the CCD sensor board with the new infrared filter in place. The filter is really dark. The light blue square on top of the board is the factory infrared cut filter. It's important not to scratch or touch this filter in case you want to reverse the conversion at a later date. The rest of the conversion is a reversal of the steps above. The most tricky part of the whole process was the fitting of the tiny flex cables. Every camera has to be calibrated differently, in case of the Nikon D70 calibration is relatively painless as the autofocus adjustment screws are located inside the mirrorbox and can be accessed without taking the camera apart. Older lenses have a infrared focus shift indicator on the focus scale (usually a tiny red dot) which is helpful if you don't want to touch your camera's autofocus system. Now that looks a lot more natural. Of course the infrared makes the grass look white and other detail in colors we are not used to, but we are not trying to achieve an all natural look. We have to remember that we are taking photos in a wavelength normally invisible to the human eye. Over time I will expand this section with Archaeological samples as well. Stay tuned.